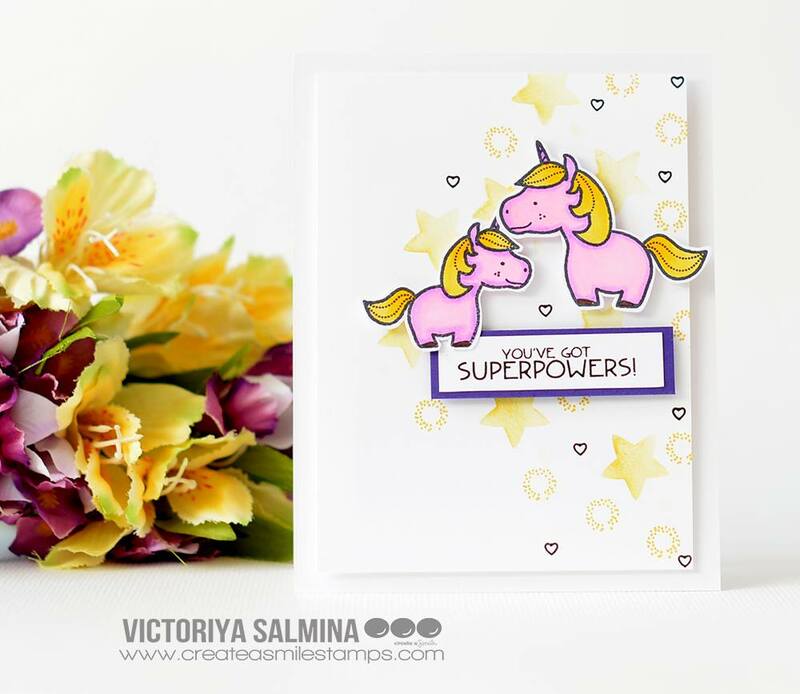 Samantha here, and today I'm sharing a tropical card full of whimsy! 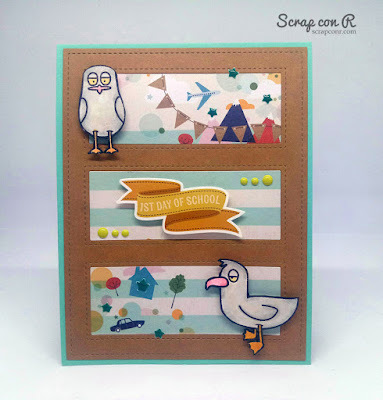 I really wanted to create that great background with Distress Oxide Inks! I love the color of the greens to the almost yellows! And I thought, what better way than to pop some tropical flowers on top! - this stamp set is really cool, because you can stamp the inside and outside lines of the images! - I stamped the flowers with the 'inside' portion first with two different Distress Oxide inks with the rock and roll technique! - then I stamped on top with the outline image! 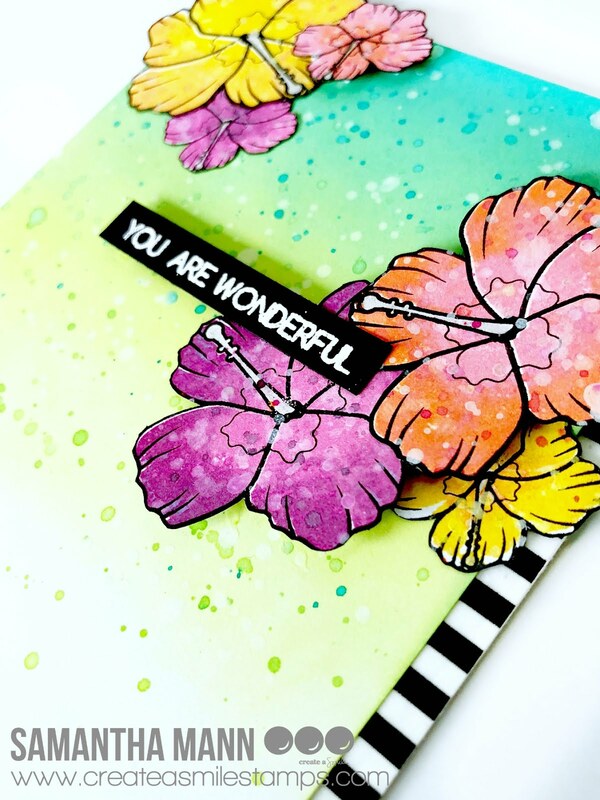 What a great way to get flowers stamped and colored! - on your card front, I used a combination of Lucky Clover, Cracked Pistachio and Twisted Citron Distress Oxide Inks! - then I splattered some color on top of all the images and background! 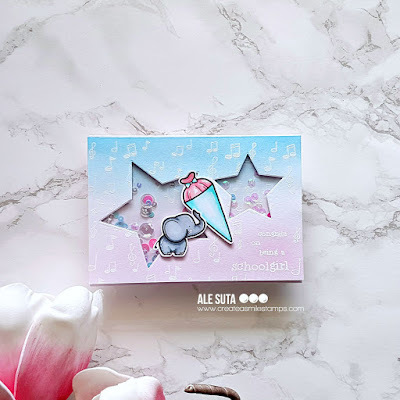 I love this cute card! The 'sea' was created with Distress Ink and watercolors. But you could get a totally different look if you ink blended the 'sea'! 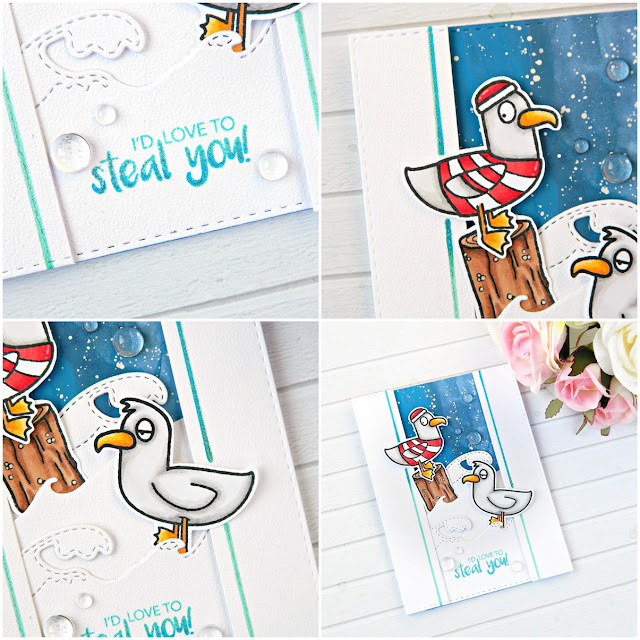 That sentiment is created with the All About You stamp set! LOVE the versatility of the set! The flower images are from Aloha Spirit! Good news - get your eyes and brains ready for a FUN new release in September!! Yay!!! I can't wait for you to see these stamps! Thank you everyone who entered the Masculine card challenge! 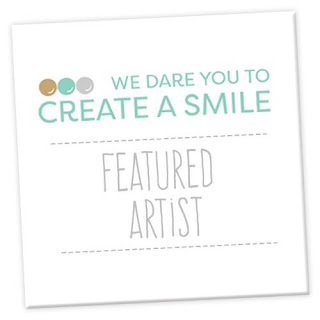 There were so many gorgeous and creative entries and as always is hard to pick only 2 winners. 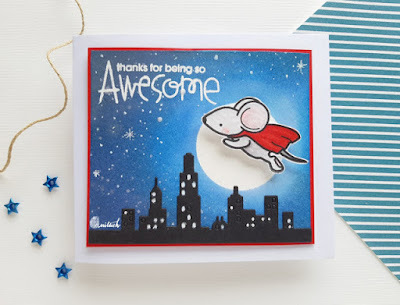 She created this adorable card featuring our Superpowers stamp set ! 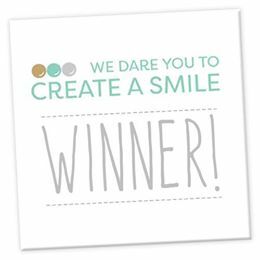 Congrats Ishani please send an email to challengeteam@createasmilestamps.com to claim your prize! Congrats Pip ! 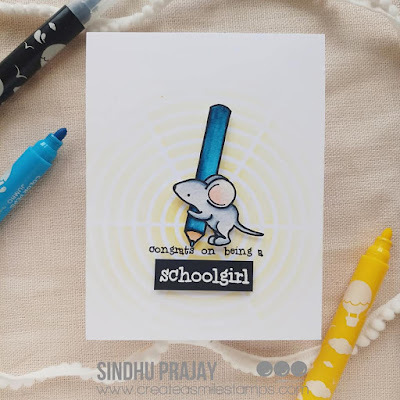 You can share the badge on your blog ! Is so well deserved! Thank you anyone who entered our challenge! 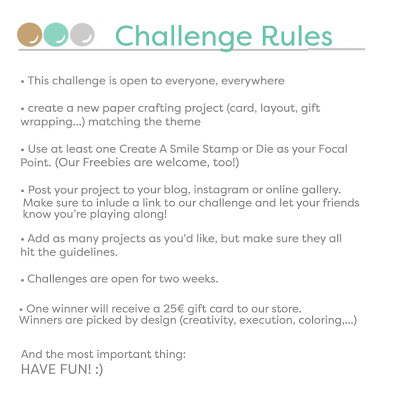 Please make sure to check the current challenge and to enter for a chance to win a 25€ gift certificate to Create a smile stamps store and to be invite to guest design for our next challenge! Today I have an easy to make and clean& simple card for you. Life is crazy right now and so I needed to make a card that takes not so much time. Loops of Love is the perfect set for this occassion. 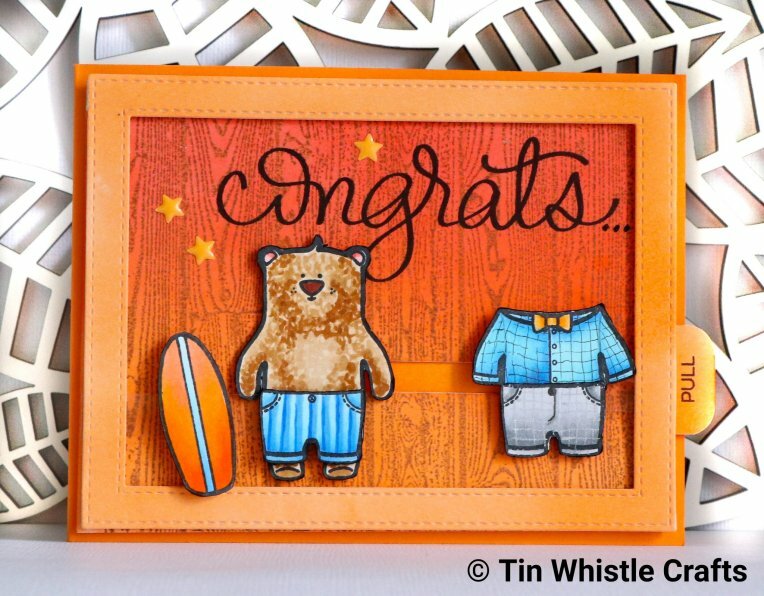 I started by die cutting a Double Stitched Rectangle from watercolour cardstock. Then I stamped an dheat embossed in white three hearts in a row. I filled the hearts with water with a brush and sprinkled the some colour pigments into the water. All that was left to do then was to stamp the sentiment. In English it says something like "How nice that you were born, we would have really missed you otherwise.". It is from a German Birthday song. 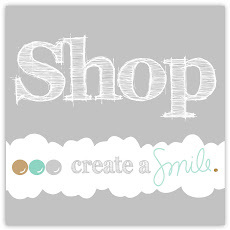 Create a Smile will be on the Stempelmekka - Europe's biggest stamp faire. Maybe you can come along, too, we would love to meet you in real life. Let's see how our guest designers were inspired by this theme! Thank you so much Rosa and Trina for being our guest designers and sharing this amazing cards with us! 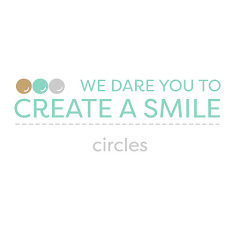 Now let's see what our design team made for this challenge! 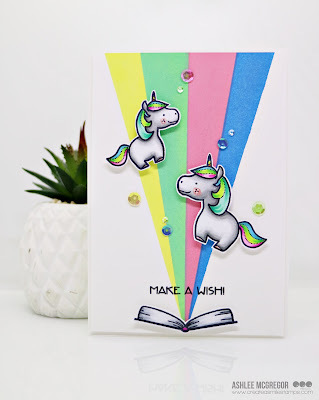 Hope you are inspired to play along with our challenge , you can also win a 25€ gift certificate to Create a smile stamps store , and also we are inviting our winners to guest design for our next challenge! 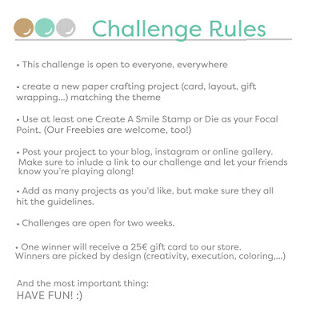 Before you enter your projects to the link up tool please take a few moments to read our rules , which are listed below! Raluca here with a brand new card showcasing one awesome stamp set from Create a Smile Stamps shop. 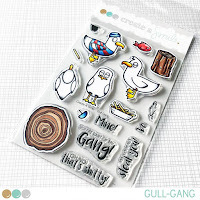 The "Gull Gang" is one awesome stamp set that it's loved by so many of you! I also adore this set and I have so much fun everytime I play with it! * First I die cut one watercolored panel using the largest stitched rectangle and adhered it to a white card base. 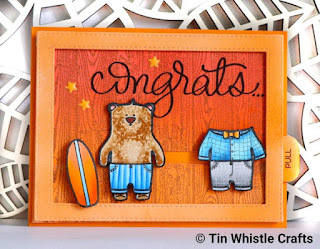 * I also die cut a white panel using the same die and cut it in two narrower pieces and mounted them on the card's sides. 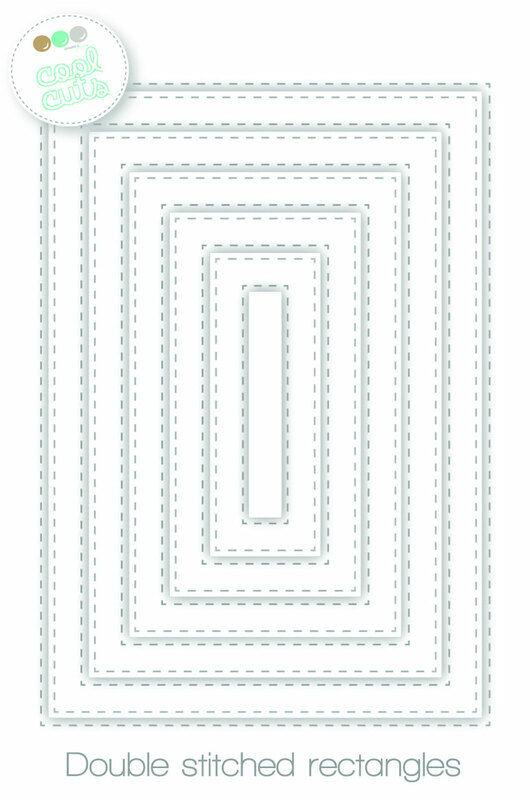 * I also die cut some waves from white cardstock and glued them inside the empty space. 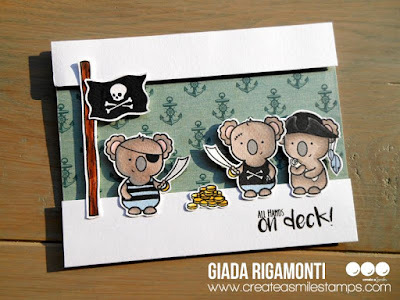 * On a white piece of cardstock I stamped the images and colored them using Spectrum Noir markers. * I fussy cut the images and mounted them on the card. * I stamped a sentiment, glued a few clear droplets and my card was done. Samantha here, and today I'm sharing a cute card, perfect to send to some one in your own 'gang'! Ha ha! I just can't get enough of those CUTE seagulls in this stamp set! I wanted to color them all up and make a little intimidating, no nonsense group of gulls! Ha! - on your card front, I used a combination of Peacock Feathers,Blueprint Sketch, Cracked Pistachio and Wilted Violet Distress Inks! 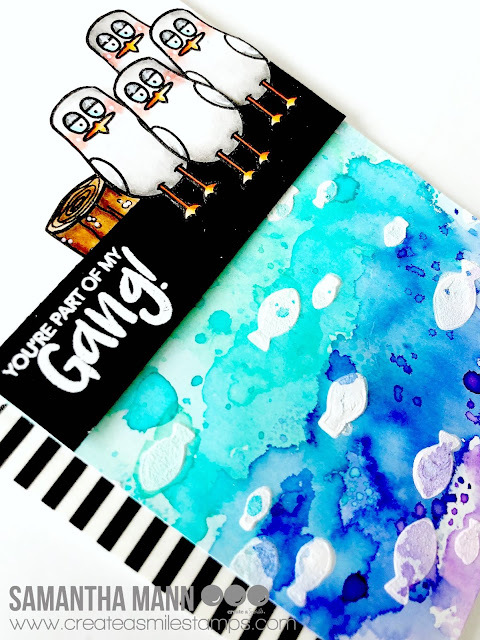 - I smooshed the colors (one at a time) onto my kraft mat, then spritzed it with water and pressed my card into the color! I did this several times, allowing the ink to dry in between each layer! 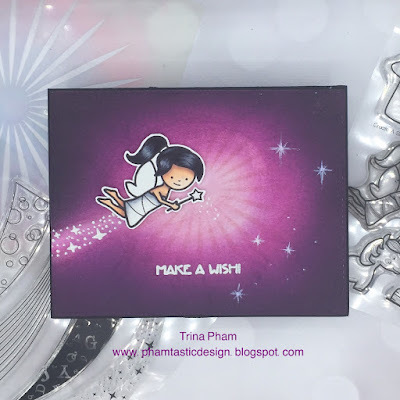 - once it was dry, I used white embossing paste and a stencil to add to the little fish images! - then popped up the sentiment strip and the frog image with foam tape! 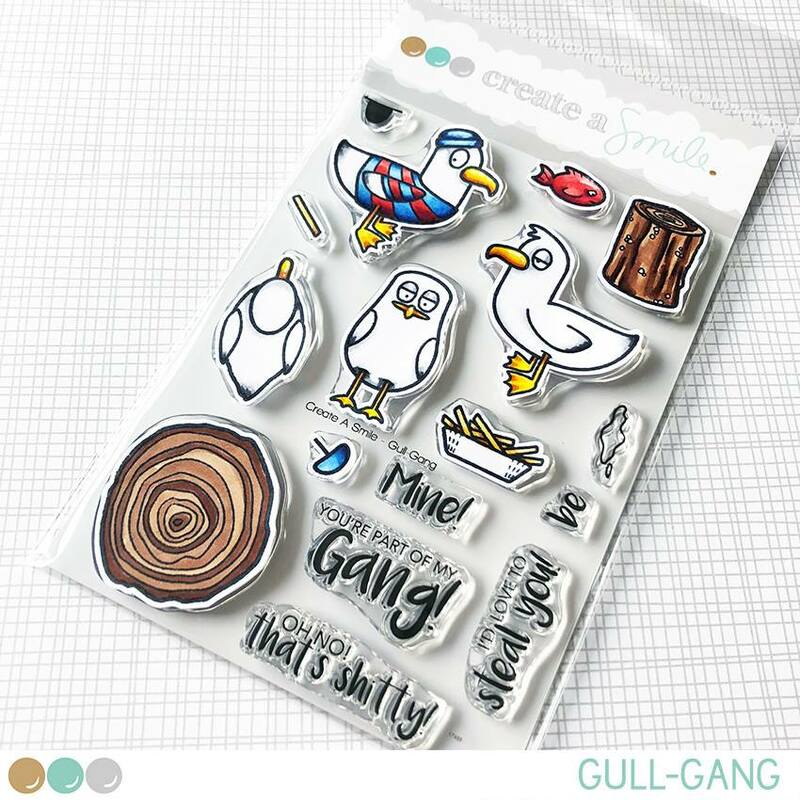 I used the adorable and funny Gull Gang stamp set! 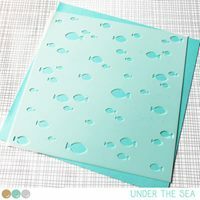 And the fish were created with the Under the Sea Stencil! 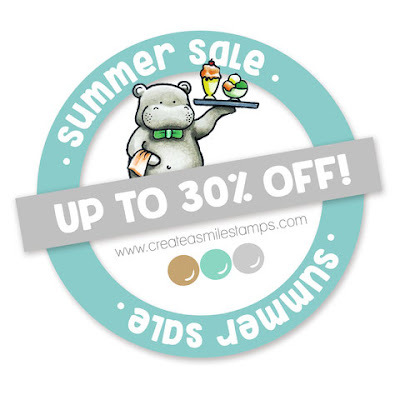 Be sure you check out the awesome sale going on now on the Create a Smile stamps shop!